Moving right along, this will be the last post before I show the final painted pics. With the shoulder pads complete, it was time to get the last few details put into place. 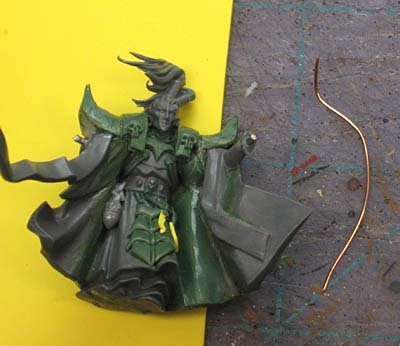 I used two small strands of wire for the base of his braids, gluing them in place gave me the "skeleton" to work from in sculpting his hair. The next big hurdle became his hands, We knew the gun hand and had settled on that in the beginning. 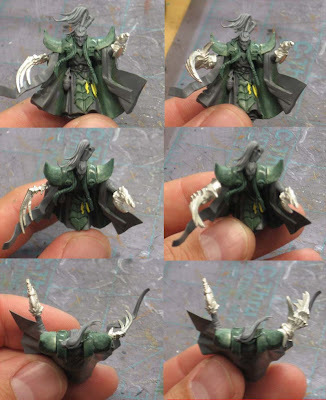 The other hand we ended up changing at the last minute after seeing the shoulder pads in place and trying to keep the scale of all the elements similar across the model. Lots of time, I'll send pics like this to my Clients so they can see what something will look like so they can make a decision one way or another about a particular bit... in this case, his right hand. 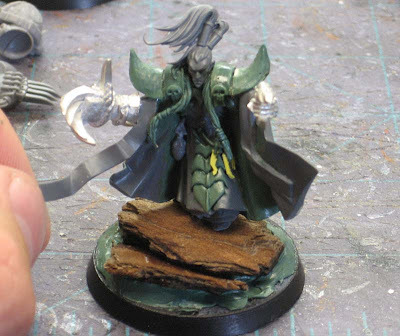 With the hand chosen, it was time to get him completely assembled and mounted on his base. A small length of wire connects the glove to his body and helps complete the illusion. With the model "complete," he was primed black and set aside to dry. We spent some time working out the freehand design on his back prior to painting, but once we had that image settled on, I got right to work. Wow, that is a really nice model. Great job! Looking forward to seeing him painted. great conversion ! .. good skills modeling ! 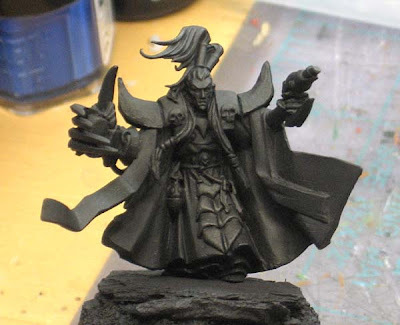 model is great but don't you think that his arms ,aspecialy left one, are a bit to long? Definitely agree with Tomek's statement. His arms now look awful as they're way to long. It looks like he can touch the ground with his real hands (not the claws) whilst standing up. Very nice stuff, but the arms don't really work out. I don't care for the overlarge claws - he'd have a very hard time standing up straight. Dunno. Might be the pics, but it looks fantastic without the arms. 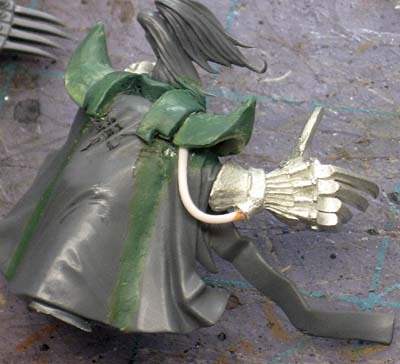 Maybe replace with plastic Eldar/Dark elf arms? I see what you're saying guys, but we decided to use the larger claw that has the same effect on the original model. It can be tough to choose sometimes, you have to balance look with "accuracy" and we all know that not everything is to scale in 40k. I personally like the scale of the arms - big and brash in your face 'hero' scale too. Can't wait to see the finished product - stop this teasing Ron!